Last year The Webmaster had the most pathetic tournament performance of his long and storied career. Even though his on-ice play was far below his normal and expected level, once again the Chaos website was superb. In particular, the motivational pages reached new heights which was confirmed by the overall play of the rest of the Chaos players. 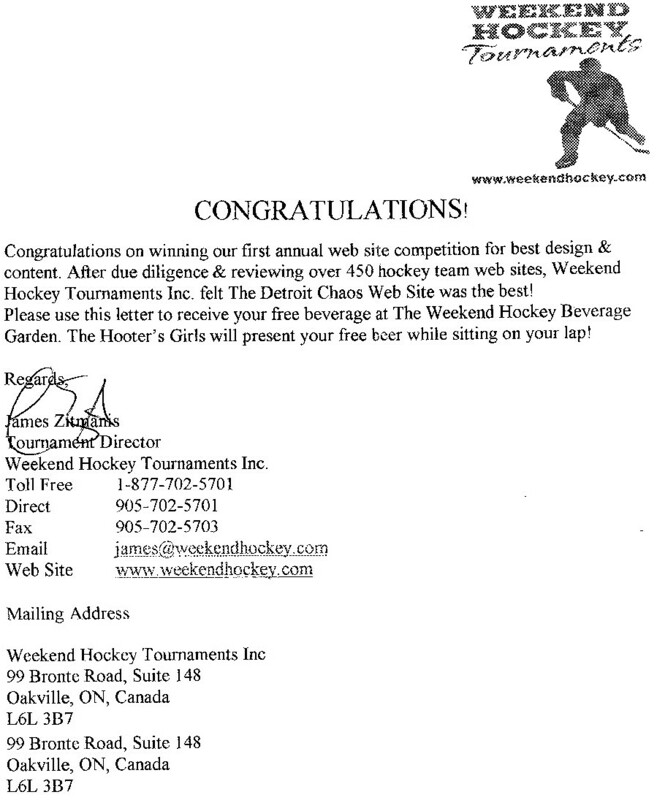 In addition to the Championship Trophy, the Chaos website was the run away winner in the first (and probably only) website competition. Below is the certificate presented to the Chaos which was not nearly as valuable as the free beer and Hooter girls. The Webmaster accepted the award on behalf of the entire team. He certainly recognizes that without the insanity and craziness of the entire team, the award would not have been possible. Thank you.